The Fight For $15 is a national movement focused on unionizing low-wage food service and retail workers. The movement is facing dozens of state-level restrictions on raising local labor standards. Photos by the author. When Tanya Harrell speaks, her easy-going New Orleans accent is strong. She was raised by both of her grandparents in the New Orleans metropolitan area. Her family hailed from the Saint Thomas Housing Development, one of the oldest public housing projects in New Orleans, but she and her grandmother share a home in Gretna. Harrell tries her best to keep them afloat. She’s 21, courteous, composed and confident when she reflects on her life and work. Harrell tells me over the phone about her work in Louisiana with Fight for $15, a global movement to raise minimum wages. As she starts talking about it, the tone of her voice changes immediately, and even though I’m not looking at Harell, I can tell she’s smiling—she’s proud. “I love the work that I’m doing with them—keeping up with people, building relationships. I’ve learned a lot,” says Harrell. She goes on to explain how she became a leader with Fight for $15 where she does everything from canvassing to recruiting workers and often participates in speaking engagements to inform others about low-wage issues. But this isn’t Harrell’s full-time job. She also works 40 hours per week at a local McDonald’s. Her work on low-wage issues started in 2015 when she was employed at another McDonald’s on Claiborne Avenue in the Central City area of New Orleans. A friend of hers, also a lead organizer with Fight for $15, came into her workplace and encouraged her to get involved. Tanya Harrell is a leader in the Fight For $15 in New Orleans, and works at a McDonalds. Harrell was earning $7.25 per hour at the time and knew how difficult it was to get by on a low wage, let alone get ahead. Earlier that year, Harrell’s grandmother had become ill so she made the decision to hold off on getting her high school diploma in order to work full-time and help pay for her grandmother’s prescriptions and medical expenses. “Yeah, I’m with it,” was Harrell’s response. She agreed to join the fight for $15. Today, Harrell earns $8 per hour—$0.75 more than minimum wage. Still, it’s a low wage, and with $320 per week before taxes, she struggles to cover basic expenses each month. She can’t afford healthcare. Public transportation costs her approximately $20 per week so she tries to cut corners by asking for help. “If my manager drives me home, that’s a blessing,” said Harrell. The Massachusetts Institute of Technology (MIT) developed a living wage calculator to estimate the cost of living in communities across the U.S. The living wage calculation for the New Orleans-Metairie area in Louisiana where Harrell resides is $11.26 per hour for one adult. According to a study by the National Low Income Housing Coalition, minimum wage earners have to work 74 hours per week in order to afford a modest one-bedroom home in Louisiana. Approximately 53,000 Louisiana residents are paid the minimum wage and over forty percent of working families don’t earn enough to cover basic monthly expenses like housing, childcare, food, transportation, healthcare, and taxes. The federal minimum wage has been $7.25 since 2009, making annual earnings for a full-time minimum-wage worker $15,080. Many states set their own minimum wages, but only 29 states and D.C. have minimum wages above $7.25 per hour. The minimum wage in Louisiana is several dollars below what studies say is a living wage in New Orleans. But state law prevents New Orleans from raising its wage. Louisiana is one of five states that have not adopted a state minimum wage, and one of 18 states to pass law preempting local labor standards in 2016 and 2017 alone, according to the Economic Policy Institute. While 76 percent of Louisiana residents, and its governor John Bel Edwards, support raising the minimum wage to $8.50 an hour, Louisiana lawmakers voted against a bill that would do just that during the state’s 2017 legislative session. Senate Bill 153, authored by Senator Troy Carter, would have raised the minimum wage to $8 per hour in 2018 and then to $8.50 an hour in 2019, not including student employees, or some tipped workers and agriculture employees who are exempted from the federal minimum wage laws. A similar bill was also rejected the previous year. Republican Senators Bret Allain, Conrad Appel, Jack Donahue, Jim Fannin, Sharon Hewitt, Ronnie Johns, Barrow Peacock, and Mack "Bodi" White voted against raising the minimum wage in Louisiana. Senator Bret Allain was not available to comment for this story, and the other senators did not respond to requests for an interview. State legislatures around the country are also preventing cities and counties from passing their own minimum wage laws through preemption laws. These laws take away a locality’s power to enact a mandatory local minimum wage. This has been a major priority of the American Legislative Exchange Council (ALEC), a corporate-backed group with extensive lobbying resources and influence in our state legislatures. ALEC has successfully preempted local laws on issues like the banning of plastic bags, fracking, guns, pesticides, tobacco, and has drafted “model” preemption bills to prohibit local minimum wage laws since at least 2002. Louisiana’s preemptive law went into effect in 2012 following Missouri, Illinois and Minnesota. ALEC and other supporters of these laws claim they are trying to avoid a “patchwork” of wages within a state, but the National Employment Law Project states that preemption of local minimum wage laws is a priority for big business. While Louisiana prevents localities from raising the minimum wage for private sector workers, the mayor of New Orleans raised the minimum wage of city employees to $10.10 in 2015, and the city of New Orleans passed a “living wage” ordinance that went into effect in January 2016. The ordinance requires all city contractors with contracts worth at least $25,000 and companies or organizations that received tax breaks or incentives from the city to pay their employees a minimum wage of $10.55 per hour. “Pathways to prosperity can only be realized if jobs are good jobs that pay a good wage. Our workers will now be able to better support their families and provide them with more economic security,” said Mitch Landrieu, mayor of New Orleans, when he signed the ordinance into law. While Landrieu signed the living wage ordinance and publicized the law as part of the city’s resilience strategy and a way to end inequality, six months after the ordinance took effect, the city renewed its contract with a cleaning company that continued to pay its custodial workers $7.25 an hour. City Councilman Jared Brossett who authored the ordinance also criticized the Landrieu administration for violating terms of the law and its slow process in bringing existing contracts into compliance with the law. Following the city ordinance, Step Up Louisiana was formed. This membership-based group works on economic justice and education justice issues developed a 3-Point Economic Justice Platform: a $15 minimum wage, equal pay for equal work for women, and banning the box to stop discrimination against job applicants with criminal records. They have also held town halls as New Orleans 2017 municipal elections near and encouraged 28 candidates to publicly adopt the 3-Point Platform, which includes working towards a higher minimum wage in the city. "This is a critical election for our city," said Ben Zucker, Co-Director of Step Up Louisiana, and former Fight for $15 organizer. "We must hold all candidates accountable to the urgent needs of our community, like addressing poverty, and inequitable education system, and crumbling infrastructure." Together with the Fight for $15 and low wage workers, the work to unionize workers, raise local wages, and strike down preemption laws continues in New Orleans. Just before sunrise on Labor Day, dozens of low-wage workers marched towards a McDonald’s on Canal Street in New Orleans. With signs in hand, they excitedly made their way inside the building. A nationwide Labor Day strike was taking place, and they were there to demand a minimum wage of $15 per hour, and a union. Inside of the McDonald’s, they chanted and danced, smiling and encouraging workers to walk out and join their fight. A young woman that sat on a counter spoke on the megaphone. “I’m a college student, and $7.25 and $8 is not enough.” A young man in the crowd yelled back “that’s not right!” and several others echoed him. Activists gathered before sunrise on Labor Day to protest for a higher minimum wage in New Orleans. As she continued, a few New Orleans Police Department officers entered and asked that everyone leave. The crowd chanted “No justice, no peace, no racist police,” and peacefully exited. After circling the building, they stood on the sidewalk in front of the McDonald’s. Tanya Harrell took the megaphone. Chanting “Ronald, Ronald, you can’t hide. 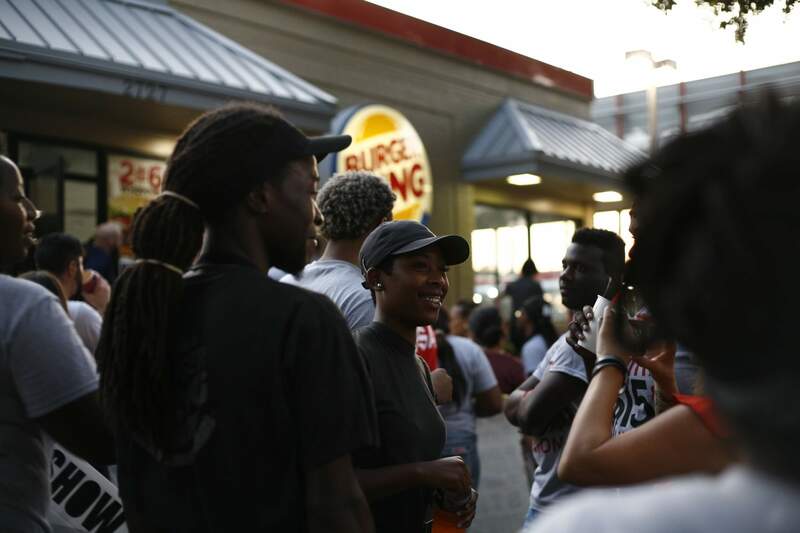 We can see your greedy side,” the group made their way towards the neighboring Burger King. Three workers walked off the job, and the crowd cheered. New Orleans’ workers and activists may not have the power to sway their state legislature. But when the legislative season starts back up in 2018, they intend to try--and they want a mayor who will back them. The New Orleans municipal primary elections will be held on October 14. Jasmin Mara López is Scalawag's Louisiana state politics reporter. Born to a Mexican family, her childhood was adversely impacted by U.S. immigration and border policy. This instilled in her a strong passion for immigrant rights, youth empowerment, and social change. Could a Universal Basic Income Solve Appalachia’s Post-coal Poverty? While a three-week reprieve to the 35-day government shutdown is easing some of the pain, the month-long spat between President Trump and Democrats in Congress threatened the livelihoods of people receiving government assistance all over the country. Local economies are still feeling the ripple effects, and many fear the new negotiations could lead to another damaging impasse. In central Appalachia, where one in four residents live below the federal poverty line, the shutdown adds urgency to a long-standing debate about what a safety net in rural America would look like, and whether there are ways to construct programs that would be more immune to the politics of the moment. One solution increasingly becoming a part of the mainstream political discourse: Universal Basic Income. UBI—a federally-provided, no-strings-attached monthly payment to all U.S. adults, similar to Social Security—has been proposed as a potential solution to rampant poverty since Richard Nixon’s presidency. Professor and rapper A.D. Carson writes about how we’re taught to kill our childhood monsters, and the sinister implication when the monster is Blackness. “Vine City through a lens” is a photographic narrative of a historic Black neighborhood located in Atlanta’s Westside.